A Win/Mac developer recently asked me what I thought about his plan to create a binary of his application and sell it to interested Linux sound and music people. He asked with some trepidation, having already received a rather critical chorus of objection from some overly enthusiastic Linux users. This man's work is excellent and his software already runs nicely under Wine. He also dedicates part of his time to creating free and open-source software, hence his interest in the viability of commercial Linux audio applications. As a result of this inquiry I decided to revisit the Linux soundapps site and check up on the commercial sound and music software for Linux. This article reveals and ponders some of the results from that visit. The Linux audio world is no stranger to the presence of commercially available software. In the latter 1990s I listed the Ceres multitrack editor (no relation to the NoTAM app of the same name), the Jazz++ MIDI sequencer, and of course the excellent OSS sound driver package from 4Front Technologies. At that time the Linux audio world was just starting to have a sense of itself, and the list of available software was rather small compared to today's embarassment of riches. With the founding of the Linux Audio Developers group the development of FOSS audio software progressed rapidly, quickly obviating the need for commercial equivalents in some domains (hard-disk recording, sound editors, audio/MIDI sequencers, sound processing plugins, et cetera). The Ceres editor disappeared from distribution, Jazz++ eventually converted itself to an open-source GPL'd project, and the OSS drivers continued as a commercial product until recently (their OSS/Linux package is now freely available). The period from 2000 to the present day has witnessed an explosion of development in the Linux audio world. However, not every niche in that world has been occupied by free software, and there are some developers who create their niche-filling software for sale to Linux users. Let's look at some of those packages and consider their value relative to the existing free packages that are similar or identical in function. Before we begin this whirlwind tour I must declare that I am not at all opposed to the notion and practice of commercial Linux software of any kind. The user is still free to decide that he or she can live without a commercial product, nor do I believe that commercialism will somehow inevitably corrupt the world of FOSS Linux audio software. Personally I welcome more such software, especially if it addresses some glaring lack in the current free software armory. I prefer free solutions, but if a commercial tool exists that does the needed job, then I'm all for using that tool until a free alternative exists. Heresy ? Perhaps, but I've never seen much sense in denying myself the opportunity to complete my work as I see fit. Okay, enough said on that topic, let the tour proceed. As far as I know, there is currently no complete list of the commercially available sound and music software for Linux, so the programs profiled here may not be the only such software. Despite the brevity of this selection I expect more commercial audio offerings as more cross-development development occurs and as more users migrate from Windows to Linux. Those users will clamor for their familiar titles, and manufacturers will either respond with product or other developers will step up with their own equivalent or better programs (free or not). Transcribing music from recordings is a necessary and often tedious activity for the practicing musician. Players have resorted to all manner of assistance to get the job done as quickly and accurately as possible. In the days of vinyl we played a 33 rpm (revolutions per minute) disk at 16 rpm for a performance at half-speed but pitched nearly an octave lower. We dreamed of a machine that could slow the tempo of the performance without altering its pitch. Transcribe! facilitates the transcription of music from digital audio sources. The program includes all the functions of my dream machine and adds advanced features such as the ability to analyze chord harmonies and pitch sequences. Transcribe! displays the analysis data in common note-names and octave registrations, a very helpful feature for musicians. Indeed, as Figure 1 shows, the program is musician-friendly throughout. The Audio Effects And Controls panel (Figure 2) contains Transcribe! 's many processing options and realtime controls, including its high-quality time compression/expansion and pitch-shifting. I tested realtime tempo change on an old blues recording (a transfer from a 78 rpm disk), a song by ZZ Top, and a canticle by Hildegard von Bingen, with impressive results. Even at 35% of the original tempo Transcribe! 's sound quality was very good, with few audio artifacts. As I write this article Transcribe! sells for £25, about $52 US dollars and €36 euros (but see the Transcribe! Web site for current pricing). A 30-day demo is available for download, in versions for Linux, Windows, and the Mac. If you need software for faster and more accurate transcription of music, download the demo, run it, and decide for yourself if Transcribe! is what you want. In this writer's opinion Transcribe! is well-written, well-supported reasonably priced commercial Linux audio software that fills a particularly useful niche. Highly recommended. 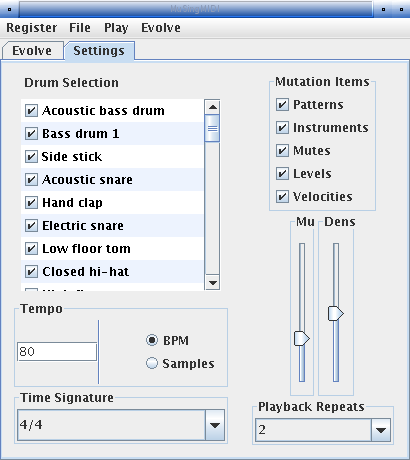 MuSing is a Java-based "evolver" for rhythm patterns and loops. The user loads a set of beats, then MuSing transforms them into new beats. The concept sounds simple enough, but MuSing doesn't simply perform a random shuffle of a beat's elements. A good drum part balances repeated patterns against organic variants of those patterns, and that's the job MuSing sets out to do. The program succeeds at its primary task, i.e. creating new patterns with clearly audible similarities and variations between generated versions. The task is non-trivial, but MuSing is no mere toy. These organic variations are highly desirable when the recordist is designing convincing drum parts, and MuSing will tirelessly and continuously evolve a beat pattern (though not in realtime) until the user is satisfied with the results and saves the new beat pattern as a MIDI file or a WAV or AIFF soundfile. MuSing comes in two versions in a single package. 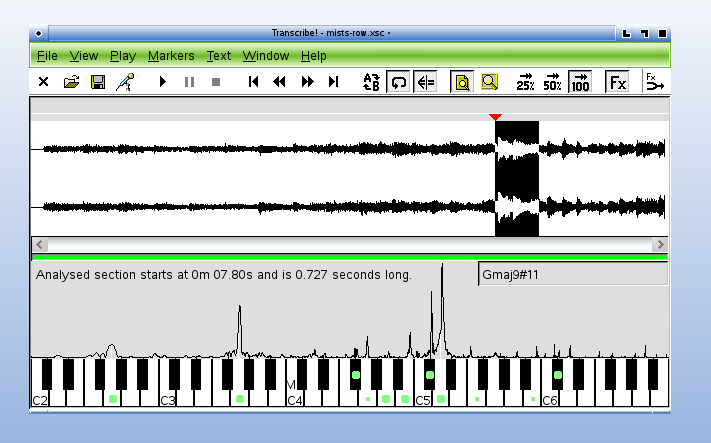 One flavor works with MIDI data, the other works with audio files, but both work with the same unusual GUI (Figure 3). In fact, the interface is straightforward and efficient. Five beat patterns occupy the upper hemisphere of the "life-preserver" circle, with three processing icons in the lower half. 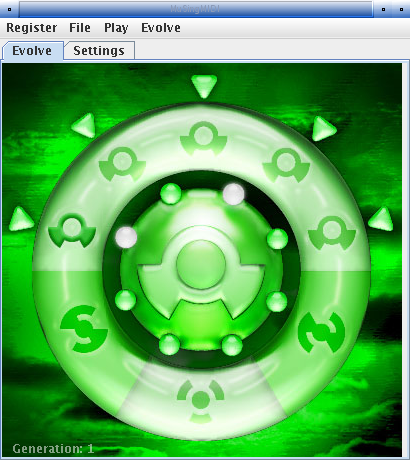 Just select a pattern and click on the Evolve key (the symbol at the bottom of the circle) to start reconstructing your beats. Save your work by clicking on the Save key (the symbol at the bottom left of the circle). The remaining key activates the New Generation switch. This key replaces the current pattern set with a new set of sounds and grooves (which can include your own soundfiles) for further beat mangling and manipulation via MuSing's Evolve function. The process is fast and easy to learn, and you can quickly create large libraries of related beats. 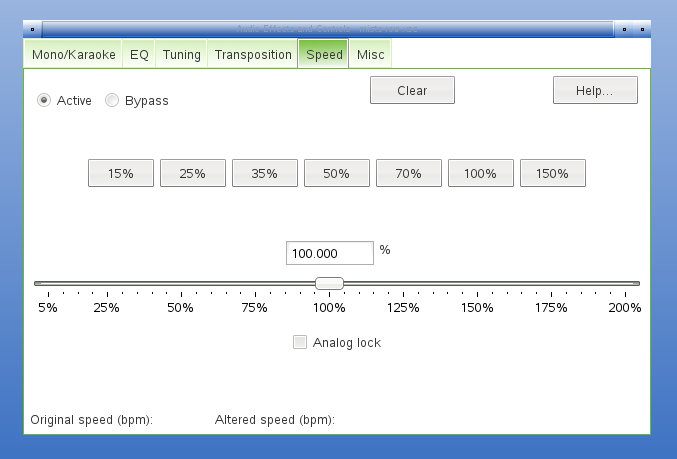 The rest of MuSing's unique GUI includes a Play All Beats control and a Settings dialog (Figure 4) for configuring tempo, time signature, drum selection, and mutation parameters. Tooltips help is on by default, and HTML help is included with the package, so you should be up to speed with the program in only a little time. I tested the demos for both versions of the program. Alas, only the MIDI version worked for me. I used the same Java (1.6), the same distro and hardware for each version, but I got no sound from the audio version. The program reported no errors, and it's possible that I missed some aspect of its audio output configuration. Musing is priced at $24.95US for the bundled audio and MIDI versions. I consider the cost a fair price for such a specialized program, and I encourage all aspiring beatmeisters to check out the MuSing demos. They can be downloaded from the MuSing Web site, complete with example sounds and beat patterns to get you started quickly as possible. EnergyXT2 (or eXT2 as it's popularly known) is hardly a niche-filler. 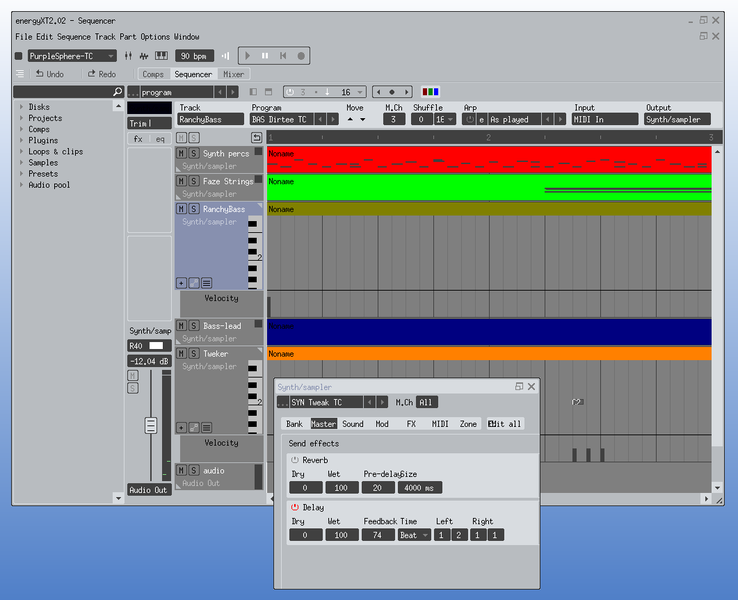 This program is a full-grown audio/MIDI sequencer with a wealth of tools and utilities for digital music and sound production, including notable features such as high-quality pitch and time compression/expansion, built-in synths and samplers, and support for native Linux VSTs. eXT2 is a mature program (I tested version 2.0) aimed squarely at the desktop composition market, and it is indeed an impressive product. eXT2's features list compares favorably to sequencers such as Cubase or Rosegarden, and the interested reader can get a quick overview of those features on the eXT2 Specs page. Its overall design breaks down into six major components: the audio/MIDI sequencer, an editor for eXT2's synths and sampler, a drum track/editor, a powerful and flexible mixer, a helpful resource browser, and a unique "modular" page in which you can construct audio synthesis and processing chains from the various supported plugins (internal, LADSPA, native Linux VST). And just to be perfectly clear: The Linux version of eXT2 does not support native Windows VST plugins (i.e. in their native DLL format), the VST plugins supported by eXT2 for Linux have been recompiled in a native Linux format (e.g. Freeverb.so). eXT2 sells for $75US. That price gets the buyer a dual license for both the Windows and Linux versions, unlimited personal installations, and free updates. If you'd like to try before you buy, a demo is available with all features intact except for the Save function. By the way, eXT2 also has a lively community presence on the KVR-Audio site, a major site for VST and other plugin and host developers and users. Check it out to see how its users feel about energyXT2. I compared these programs with freely available equivalents where possible. Alas, Transcribe! doesn't really have a competitor, though Chris Cannam's Sonic Visualiser and the outstanding CLAM project provide similar tools. MuSing goes toe-to-toe with Ollie Glass's Breakage, though I suspect that new users will likely find MuSing easier to use initially. EnergyXT2 definitely faces stiff competition from Rosegarden and MusE, and the potential user will have to decide if its unique features are compelling enough to separate the user from his or her money. 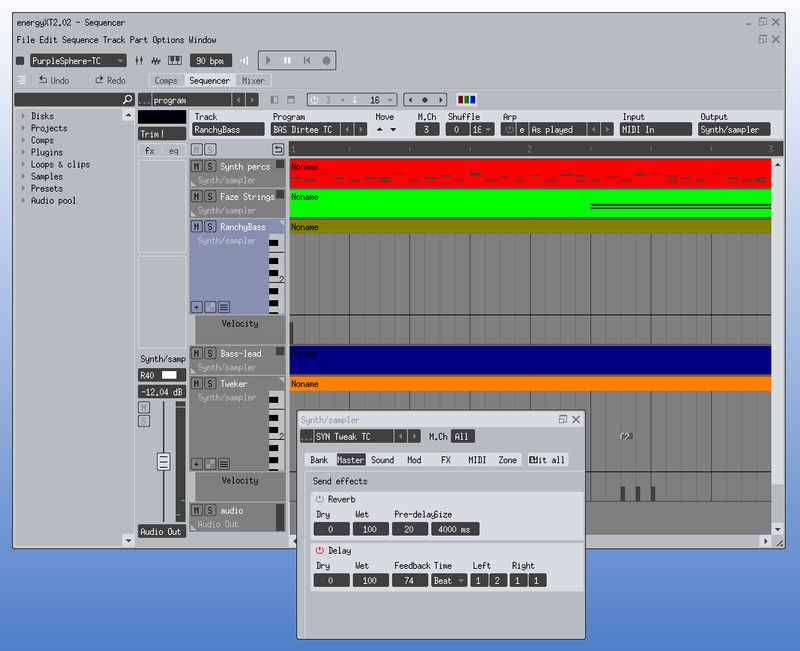 The second and final part of this article will look at more commercial sound and music applications for Linux, including a digital signal analysis/processing application, a music programming language based on Java, a Linux distribution optimized for multimedia, and some programs marketed with Wine compatibility listed as a feature. I'll also consider service and support contracts and the subscription model as a commercial aspect of free software development. Meanwhile, check out the demos for the products listed here, have some fun, and try to make a new groove or two for this wacky world's dancing feet.